Jacks is 2.5 years old. I got him at 5 months and found out that his breeder hadn't bothered to socialize or train him at all. He came to me afraid of every other new experience. Over the last couple of years, we've faced his fear of ceiling fans, traffic, strangers, food bowls, and bicycles along with countless other obstacles. Through it all we've bonded closely and Jacks has shown himself to be the most affectionate, gentle, devoted dog I've ever known. Everyone who gives him a chance falls madly in love with him. He loves puppies and cuddling with his teddy bear. 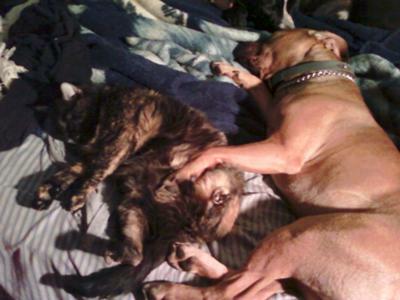 Jacks lives happily with his pittie brothers Tang and Adonis, and 3 cats who love them all. He isn't the most social pitbull, but he demonstrates the love and companionship that makes the breed such a great family pet. What a great story! He is just a beautiful boy. 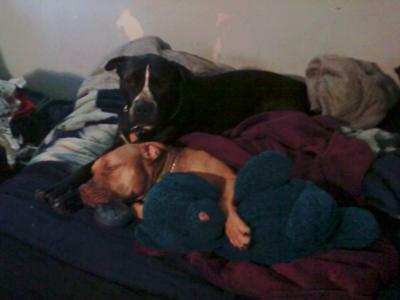 I have 2 rescued pitties myself and love the breed. Looks like you have done a great job with this handsome guy. I wish more people could understand the loving forgiving nature of this breed. What a sweetheart and clearly enjoys his naps. Thank you for sharing your story. 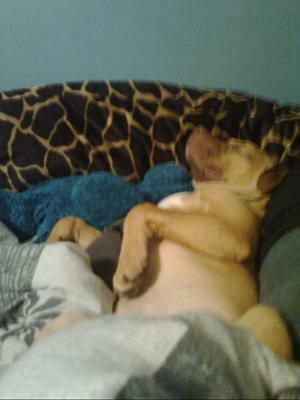 I wish that my outcome with my foster pit had been the same, but the shelter wasn't interested in working with her. Jacks is proof that with lots of love, understanding and patience, all dogs deserve a second chance. Jacks looks and has the same disposition as my blonde pit rescue. They even share the same name! Way to not give up on such a wonderful pup. It is always so rewarding knowing you made such an impact on an animal. Great story!